Storm water drainage is often overlooked due to the non-visible elements of the buried infrastructure. It is important to dispose of materials in a responsible way, as storm drains discharge directly to creeks and other natural waterways! The storm sewer system is designed to carry rainfall and snow melt, which may otherwise become problematic. As water travels over driveways, streets, lawns and sidewalks, it picks up debris, chemicals and other pollutants before washing into storm drains. By practicing good household habits, we can keep our waterways clean for fishing, swimming and drinking water! Use a commercial car wash to prevent soap and chemicals from entering the storm drain. Check your vehicles for oil leaks and use an absorbent material (kitty litter, sand, floor-dri) to clean up spills as opposed to rinsing them into the streets. Recycle used oil and other chemicals. Do not dump into the drains. Use pesticides and fertilizers sparingly and follow recommended directions. Take care to avoid application when rain is forecasted. Sweep up yard debris instead of hosing down the area. Add plants to bare spots in your yard to prevent erosion and water runoff. Clean items used for painting in a sink, not outdoors. Properly dispose of paints and other chemicals through our local recycling program. Clean up after your pet. Animal waste can introduce harmful bacteria to our waterways. Drain your swimming pool when a test kit does not indicate chlorine is present. 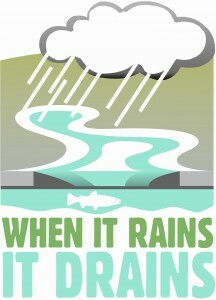 Remember… When it rains, it drains! For more information about local hazardous materials recycling, you may visit: http://www.mcswd.org/ or call (937) 225-4999. For additional information regarding storm drainage, you may also visit the EPA’s website. The City of Kettering storm sewers are separate from Montgomery County sanitary sewer lines. If you have water backing up into your home through a drain, please contact Montgomery County at (937) 781-2500 for assistance. Storm sewer repair is performed prior to concrete replacement and road paving programs. When determining whether a storm sewer should be repaired or replaced, consideration is given to the age and condition of the existing structure, proximity to utilities, performance needs and traffic safety. New storm sewer inlets and pipes are installed as designed and approved by the City Engineering Department. The storm sewer system is checked and cleaned periodically. Crews clean and inspect storm sewer openings which include manholes, catch basins, drip inlets and pipes. Channels are defined as creeks, ravines and drainage ditches which receive storm water from the storm sewer system. The City maintains 25 miles of open channels. The Channel Repair Program is designed to protect City structures (pipe outflows, culverts, bridges and utility poles) from effects of storm water runoff. If you are interested in participating in the self-help program for maintaining a private channel on your property, please contact our Engineering Department for technical guidance. View the Channel Map within the City.